Claire Waxman talking to BBC Breakfast about the publication of the Public Accounts Committee report into Efficiency in the Criminal Justice System and how delays and bad practice are failing victims of crime and putting them at risk. The report findings are justified and mirror Voice4Victims findings. It highlights the urgent need for change and better practice, however, the time scale of four years for reform is far too late for many victims already suffering due to cutbacks and failings. Claire Waxman stresses in her interview that the introduction of a Victims Law is now needed as a matter of urgency and something that the Government who published a manifesto commitment to act in 2015, must now adhere to and implement without any further delay. Claire Waxman on ITV’s This Morning following Lily Allen’s stalking ordeal and talking about what is needed to help protect victims. Victoria Derbyshire presents the daily news and current affairs programme. 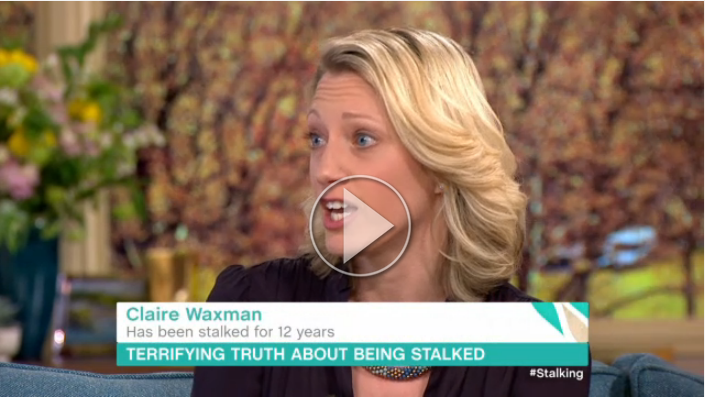 Claire Waxman speaks about her experiences of being stalked for 12 years. After all this time, Claire Waxman struggles to know what to call the man who has tormented her for 12 long years. ‘I don’t like to use his name because that personalises him,’ she says quietly. Her reluctance is understandable: for more than a decade ‘that man’ has wreaked havoc in Claire’s life, waging an intense campaign of harassment and intimidation. Claire Waxman of Voice4Victims interviewed on ITV’s Good Morning Britain. Claire Waxman has endured 12 years of anxiety and fear at the hands of a stalker. She spoke to Beverly Turner to talk about her experience and give advice to others. A former television producer who obsessively stalked a woman for more than 12 years has been jailed for a third time. Elliot Fogel, 40, has now been prosecuted five times for harassing Claire Waxman and received three jail sentences, as well as a suspended sentence and a community order. 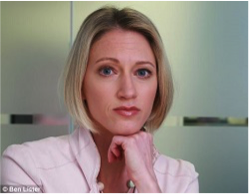 The former freelance producer for Sky Sports was found guilty of breaching the order by issuing a libel claim against Ms Waxman. THREE AND A HALF YEARS JAIL FOR SERIAL STALKER CONVICTED FOR THE FIFTH TIME. Today persistent stalker Elliot Fogel was jailed for two breaches of a lifetime restraining order preventing him from making any contact with Claire Waxman. This is the fifth time Fogel has been prosecuted. He has previously received a community order, a suspended sentence, 16 week and two years custodial sentence for past breaches. Ms Waxman won a landmark case against the CPS for not previously prosecuting Fogel in 2011 for a similar breach of the restraining order. ”Stalkers wreck their victims lives. My family and I have had to endure 12 years of persistent stalking and we just wish that Fogel would desist so that we can lead a normal life. Abusing the court process is a common tactic by stalkers. They take out vexatious court actions in order to force their victims into contact with them. Fogel used this tactic in 2006 and 2011, when he brought county court actions against Waxman. In 2011, following one of his vexatious complaints, Fogel was charged for a breach of the restraining order but the CPS dropped the prosecution claiming he had a legal right to access the civil courts. Waxman took legal action against the CPS for failing to prosecute Fogel’s breach as she believed this was a breach of her human rights. In February 2012, her application at The Royal Courts of Justice was upheld and she won her case against the CPS. “This sentence will give Claire and her family some reprieve but Fogel is a determined stalker who will continue,” said Harry Fletcher, Criminal Justice Director of the Digital Trust. This case has highlighted the need for psychiatric treatment for persistent stalkers and Frank Farnham, Consultant Forensic Psychiatrist and clinical lead for Fixated Threat Assessment Centre and the National Stalking Clinic said: “Psychiatric treatment of stalkers would benefit them and their victims. We need the courts to recommend the specialist treatment that we provide at the National Stalking Clinic”. Currently, victims’ rights are not represented in the criminal justice system. Voice4Victims campaigns for rights of victims and is working with Digital-Trust to introduce a Victims Rights Bill (see draft: www.digital-trust.org/victims-bill. Claire Waxman has also started a campaign called ‘Restoring the Balance’ to address the legal loopholes that perpetrators exploit in order to abuse their victims further and force contact with them and is working with the Suzy Lamplugh Trust and Sir Keir Starmer on this campaign. “As a stalking victim, I experienced first-hand a torrent of abuse and re-victimisation at the hands of our Criminal Justice System. I naively believed the system was there to help victims, instead it compounds their trauma. It placed the rights of my stalker above my rights to be protected”. The Voice 4 Victims campaign seeks to address the imbalance of equality though enshrining rights of victims in a Victims’ Law. Working with several victims’ organisations and charities, the campaign has amassed substantial evidence about the difficulties and injustices victims face within the criminal justice system. They have also highlighted, and looking to address the legal loopholes within the Civil and Family courts which allow perpetrators direct contact to abuse or harass their victims further. Together with the expertise of Harry Fletcher, Criminal Justice Director of the Digital Trust and colleague Kate Whaley, MAMAA, a Victim’s Rights Bill was drafted and has now gained cross party support. Claire is optimistic that it will become law and ensure that there is a culture shift towards the treatment and support of victims in this country. The Digital-Trust is a new not-for-profit organisation that brings technologists together with those professionals working within the criminal justice system and the associated support charities. This new organisation actively campaigns for more responsive legislation for victims of abuse. It also identifies risks and continuously develops new advice, tools and guidance to combat the rapidly escalating problem of digital abuse. Harry is a respected criminal justice expert and parliamentary campaigner. Harry was the Assistant General Secretary of NAPO for over 20 years. His role as a criminal justice expert has been to campaign and influence for changes in government policy. He was instrumental in getting the new domestic violence and stalking law through parliament. His current projects include: Victims’ Rights Bill, Digital-Abuse Consolidation Bill and Courts Co-operation, Enforcement and Family Courts Amendment Bill. “As a stalking victim, I experienced first-hand a torrent of abuse and re-victimisation at the hands of our Criminal Justice System. I naively believed the system was there to help victims, instead it compounds their trauma. It placed the rights of my stalker above my rights to be protected” said Claire Waxman founder of Voice4Victims. After a successful campaign, a Bill giving victims of crime enforceable rights, will be introduced in the House of Commons today by Elfyn Llwyd MP with all Party Support. The Bill was drafted by Claire Waxman and Harry Fletcher of the Digital-Trust. They strongly believe that the strengthening of victims’ rights can only come via robust legislation. “We have had a victims’ code for over a decade, yet this code is not working effectively to protect victims’ rights. It is routinely ignored and breached with no remedial sanctions. This is evident in the latest victims’ commissioner report, and those that completed our victims’ rights survey in 2014”, says campaign lead, Claire Waxman. The campaign’s Victim survey showed communication with victims was consistently poor across all agencies. The CPS, HMCTS, Witness services, CICA, Probation/ Victim Liaison Unit, Parole Board all scored over 50% in the extremely poor category, with Parole board scoring the highest with 67%. One victim from the survey comment shows the frustration over lack of communications “my case was dragged out for 18 months before getting to court, longest 18 months of my life. And in the dark for most of that time causing me more trauma“. The campaign team believes that Victims’ Rights should be placed in to statutory legislation and have drafted a bill based on their victims’ survey, current victims’ code, EU Directive and meetings with a number of victims’ organisations and services. The bill also defines an easy route for victims to complain and gain redress through a statutory body; something currently missing with the Victims code.